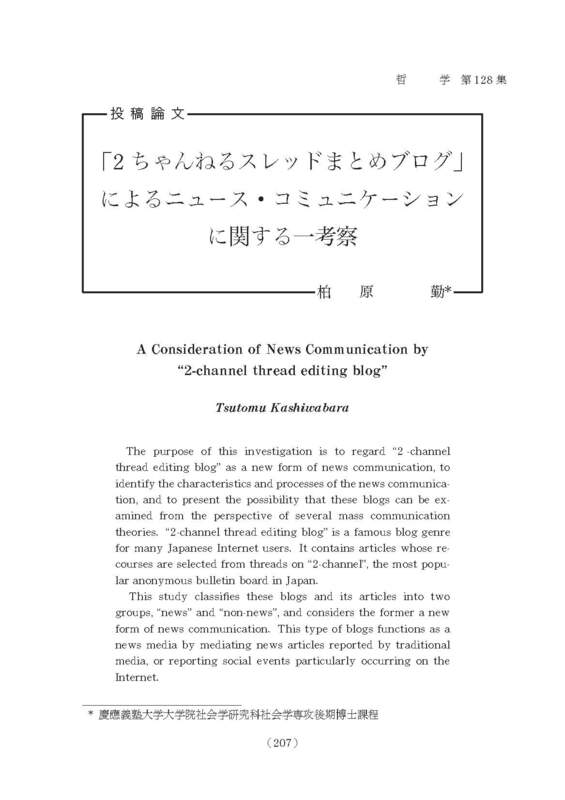 名前 A consideration of news communication by "2-channel thread editing blog"
The purpose of this investigation is to regard "2 -channel thread editing blog" as a new form of news communication, to identify the characteristics and processes of the news communication, and to present the possibility that these blogs can be examined from the perspective of several mass communication theories. "2-channel thread editing blog" is a famous blog genre for many Japanese Internet users. It contains articles whose recourses are selected from threads on "2-channel", the most popular anonymous bulletin board in Japan. This study classifies these blogs and its articles into two groups, "news" and "non-news", and considers the former a new form of news communication. This type of blogs functions as a news media by mediating news articles reported by traditional media, or reporting social events particularly occurring on the Internet. As a novel type of news media, "2-channel thread editing blog" presents some potentialities to be studied from the point of and by methods of mass communication theories or news communication researches, such as double geetkeeping, media effect theories, and so on.